In 0.99.8, we’re jumping head-first into expanding RWR PvP by introducing a series of new gameplay options which will be used in the Classic online mode revamp. See the change log here. Classic, being mostly quick match based capture / king-of-the-hill objective mode map rotation system with open choice for players to join any faction per match – we might have even called it sandbox at some point – is now being transformed into a proper PvP oriented game mode, which shall be referred to as Dominance from here on. The basics are the same. The general objective is to capture more bases than the enemy faction(s). Capture-based maps end when one faction gains total control, king-of-the-hill -maps end when a faction manages to hold a central base for a given time to win. Matches can also end by a timer if the objective is not met in 45min/30min: the faction holding more bases at the end wins. In Dominance, the capture maps will be using a new base capture system based on the idea of being able to capture specific marked enemy bases only which are close to the current border. This increases options where to attack/defend over the single base capture mode which was in use in Classic recently, but it also attempts to avoid the exaggerated focus on backdooring that the open base capture mode system suffered in Classic back in the day. 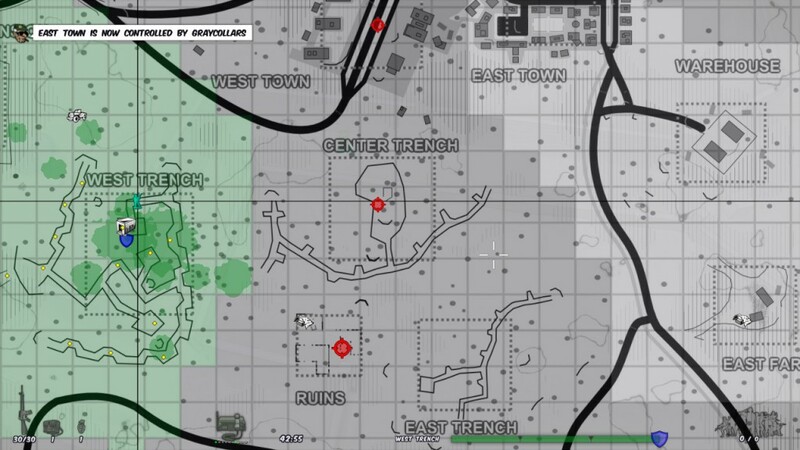 Capturable, both own and enemy, bases are denoted with markers in the map view. Moreover, Dominance now features persistent profiles in PvP environment making long-time stats tracking more interesting. Both match and total stats are being tracked, which you can view and toggle in the scoreboard. This also allows a level of progression to take place in Dominance, which we still want to keep subtle enough for balanced PvP regardless of player ranks. Dominance comes with customized XP / RP rewards and related requirements for most elements, and loot items have been removed in favor of focusing to fighting rather than adventuring. We’re currently testing and tweaking the settings for Dominance, and I hope we’ll see more people get in regularly for some PvP fun with us. Also, it’s Sunday and time for the weekly PvP event soon, so obviously we’ll be trying out the new stuff there. Currently SAS Beerdrinkers is working as our main test site, again big thanks to DocStone! Suggestions are welcome as always, and we’ve been having a fine discussion going on in this thread, join in!